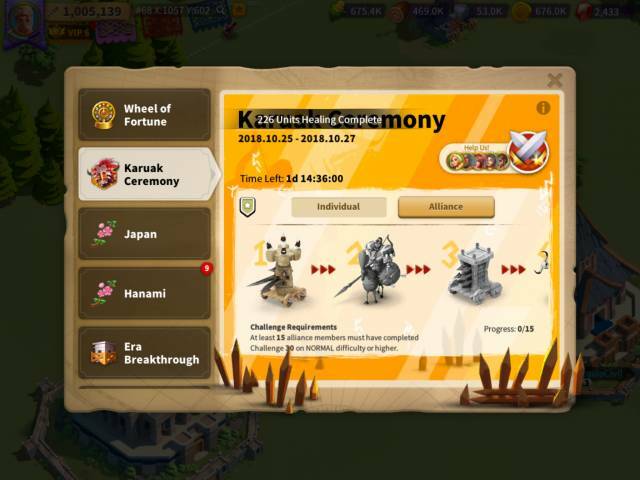 This is an update to the game version 1.0.10 and introduces a new event, The Karuak Ceremony to Rise of Kingdoms. It is a 3 day event intended to encourage teamwork between governors within an alliance. During the event you can use action points to summon Karuak challengers of increasing strength. You can battle solo, or via a rally with members of your alliance. Once an alliance's members complete a certain level of these challenges an Alliance Boss challenge will become unlocked. We are playing this ourselves in order to create our Rise of Kingdoms guide and although there are multiple difficulty levels to choose from when you start the Karuak Ceremony, you only select the Easy difficulty level. Once you complete the Karuak Ceremony on easy level, then you can opt for the next level of difficulty the next time the Karuak Ceremony event takes place. For each level of difficulty there are 100 levels to get through. As you progress through the levels, the battles get harder and harder. However you should be able to send in multiple commanders to help you defeat any that are too difficult to do alone. Don't forget in this event you can also ask your alliance to assist you with certain battles, and make a rally. Rallies are great to participate in to help other alliance members and there is also the possibility of bagging a heap of XP for your commanders especially if the rallies are against the higher levels. There rewards for getting to the higher levels in the Karuak Ceremony are great, especially if you get to Level 100! 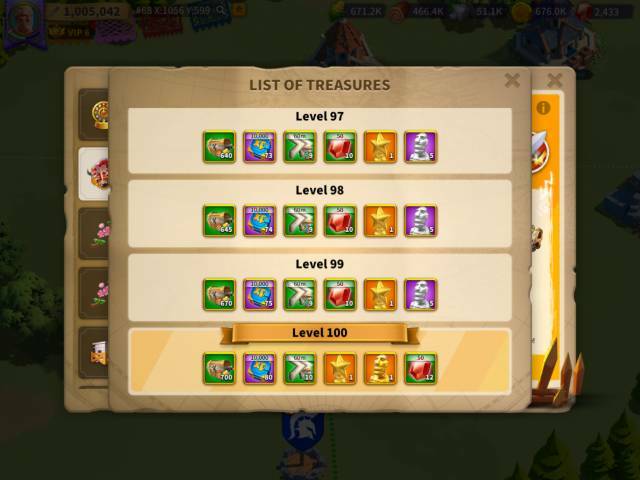 With tons of gems, tomes of knowledge, speed ups and resource chests to be had. You could also get a gold star and statues too. Tap the Occult Treasure link on the ceremony page to see what you'll get for reaching a certain level by the end of the event. When you first take part in this event, you will only be able to participate in Easy mode. If you manage to complete all 100 levels, then next time, the next higher level will be unlocked and available for you to compete in. And so on... Complete all 100 levels of the challenge and next time, the next level will become unlocked. 3. Activate 12 or 24 hour enhanced attack buff and the 4 hour basic army expansion. This will strengthen your troops and allow your commander to attack with a bigger army. This will save you action points as each commander will now be more efficient. 4. Work out which of your commanders use the least action points for each barbarian attack and use that one as the main commander throughout the event. 5. In many of the early rounds you will only need to send one army, so with that army buffed and using the commander that uses the least action points is the most efficient way forward - assuming that commander has also been leveled up! 6. Lohar or another commander that has been leveled up in Peacekeeping Talent is likely to be the best commander to use. 7. An alternative method is to use more action points and attack with more commanders (even if you don't need to) the idea being is that they will also benefit from the great deal of XP that you can gain from defeating some of these barbarians. 8. Rally - Use rallies when you need to so your alliance will help you with your attacks. Also, look out for rallies from your alliance members, it is a great way to pick up Commander XP, and help out your mates. 1. Clear the vicinity of other barbarians first so they don't get involved in your battles with Udor barbs. 2. Stay attentive so that you always have at least one commander engaged in battle, as one commander dies, when they get back to base, send them back into base while your others are still fighting. This uses up tons of action points, but the XP you get for all participating commanders and the rewards at the end of the event are worth it.